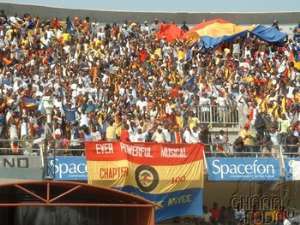 Kumasi, Feb. 14, GNA - Agya Atta Akwasi, Kumasi Asante Kotoko's oldest gong-gong beater who often inspires the team during its matches at the Kumasi Sports Stadium and other stadia throughout the country on Saturday publicly renounced his support for the club and joined their arch-rivals Accra Hearts of Oak. The 86-year-old gong-gong beater has since 1975 actively beaten the instrument to support the Club that he adored until last Saturday when he renounced his support for his mother Club. Announcing his decision at the annual assembly of the Delegates of the National Chapters Committee of Accra Hearts of Oak Sporting in Kumasi, he expressed gratitude to the management of the (NCC) of Hearts for accepting him into their fold. "In spite my old age, I am hopeful that I will be able to serve Hearts with my strength and I would therefore need the support of all", he said. Agya Atta cited what he described as maltreatment meted out to him by the present management of Kotoko as his main reason for resigning from the club. "I am also enthused about Hearts recent performance in Africa and I believe the Phobians will give me joy in my old age". Welcoming him into the Phobian fold, Mr Armstrong Mortagbe, Chairman of the NCC commended Agya Atta for his sense of objectivity and called on him to be dedicated to the Club to enable him achieve his hearts dream.